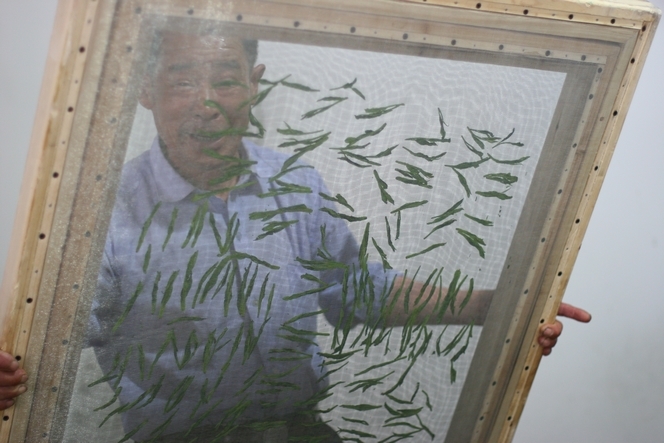 After being fired, then rolled individually by hand, Taiping Hou Kui leaves are placed between two meshes. Moments later, the upper mesh is covered with a cloth and pressed with a roller, to flatten the leaves. This painstaking task does not take place for any other tea. In this photo I took during my last trip to China, you can see how proud this producer is, preparing for the last stage in the processing of this fine green tea, the drying. The leaves you see here are held in place between the two meshes, and have just been flattened.